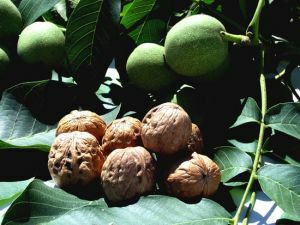 Walnut is a delicious and healthy fruit, and preserves within its shell all the healthy properties that nature has entrusted to it. It has a high content of OMEGA 3 and OMEGA 6, of Vitamin E, of Vitamins of group B, of mineral and mineral salts, of essential amino acids : this is a precious completion of a balanced daily diet and Nutritionists recommend eating regularly throughout the year and not just during the winter months. Proteis 14,3 gr. 3,6 gr. Carbohydrates 5,1 gr. 1,3 gr. Fat 68,1 gr. 17,0 gr. Polyunsaturated fats 40,7 gr. 10,2 gr. Linoleic (omega-6) 34,0 gr. 8,5 gr. Linoleic (omega-3) 6,6 gr. 1,7 gr. Fibers 6,2 gr. 1,6 gr. Cholesterol 0,0 gr. 0,0 gr. Salt 0,02 gr. 0,005 gr. Thiamine (B1) 0,5 mg. 0,1 mg.
Riboflavin (B2) 0,1 mg. 0,0 mg.
Niacin (B3) 1,9 mg. 0,5 mg.
Vitamin A (Retinolo eq.) 8,0 µg. 2,0 µg. Vitamin E 3,0 mg. 0,8 mg.
Calcium 83,0 mg. 20,8 mg.
Iron 2,1 mg. 0,5 mg.
Phosphorus 380,0 mg. 95,0 mg.
Magnesium 131,0 mg. 32,8 mg.
Potassium 368,0 mg. 92,0 mg.
Selenium 3,1 mg. 0,8 mg.
Zinc 2,7 mg. 0,7 mg.